Crucial to Israeli colonialism is an attempt at the destruction of Palestinian society. This is part of a bid to secure demographic majority over non-Jewish people across all of historic Palestine and maximal control over the territory and its resources. Pursuing these goals necessarily involves hindering Palestinians’ ability to raise their next generation and to sustain, educate and care for themselves and each other. The institutionalised destruction of Palestinian women’s lives has thus been an essential feature of the Israeli project. 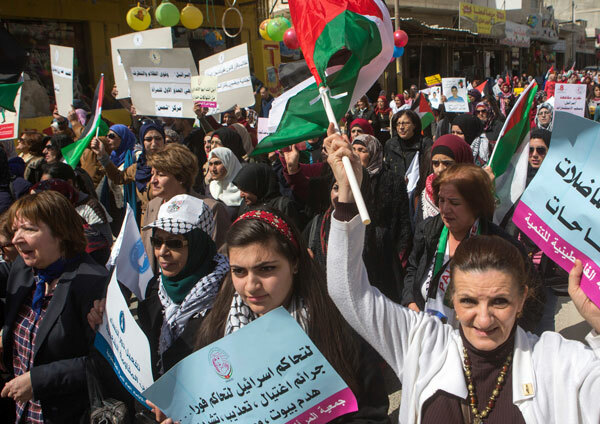 And as the world celebrated International Women’s Day, and in a time of the #MeToo movement, it is important to remember how Israel has systematically carried out violence against Palestinian women, undercut their healthcare, and undermined their socio-economic conditions. In this regard, Israeli settler-colonialism can be seen as intrinsically anti-feminist and a form of gendered violence. Israeli violence against Palestinian women is also frequently fatal and on a large scale. During Israel’s December 2008-January 2009 offensive against Gaza, 110 Palestinian women were killed. During Israel’s summer 2014 assault on the territory, Israel massacred 230 women. Base violence is just one of the weapons being deployed against Palestinian women. Targeting Palestinians’ access to healthcare and reducing its quality, both in Israel and in the occupied West Bank and Gaza Strip, is another. The rate of infant mortality among Palestinian citizens of Israel is 6.4 per 1,000 live births, almost three times higher than it is among Jewish Israelis. Last month Israel’s high court took steps likely to worsen this problem by rejecting a petition demanding the re-opening of a mother-infant health clinic serving some 1,500 people in two Palestinian communities in Israel. Physicians for Human Rights-Israel, meanwhile, has outlined a variety of mechanisms through which Israel undermines Palestinian healthcare in the West Bank and Gaza. These include Israeli control of the Palestinian Authority’s budget, including its health budget, and limiting the free movement of patients, medical personnel, ambulances and medications between the Gaza Strip and the West Bank, including East Jerusalem, as well as within the West Bank. Such practices contribute to Palestinian women having worse health outcomes than their Israeli counterparts. Maternal mortality in the West Bank and Gaza is four times higher than in Israel. Life expectancy of Israeli women is on average 10 years longer than it is for Palestinian women. Meanwhile, at the checkpoints Israel has established throughout the West Bank, Israeli soldiers have blocked pregnant Palestinian women on their way to hospital to give birth. In Gaza, health care is inadequate because of the Israeli blockade. Patients in need are at the mercy of the Israeli military to grant them a permit for travel, which is often delayed or denied. In 2016, for instance, the Women’s Centre for Legal Aid and Counselling reports that 1,726 such permits were denied and 8,242 were delayed so long that they did not receive a response in time for their medical appointments. Israel’s large-scale military assaults on Gaza have further undermined women’s health there. According to UNESCO’s Commission on the Status of Women, Israel’s 2014 attack left healthcare centres damaged, without sufficient medical equipment and supplies, and healthcare providers unable to properly meet the needs of women and girls requiring sexual and reproductive health services. Similar problems exist with Palestinian women’s education and employment. The UN’s Committee on the Elimination of Discrimination against Women has expressed its “concern about the systemic discrimination experienced by national minorities” living in Israel, specifically Palestinian women and girls. The committee notes that Palestinian women and girls have unequal access to education – as do their ultra-Orthodox Jewish counterparts – which leads to higher dropout rates and poor outcomes in higher education. Daoud points out that the “severe shortage” of day care centres in Palestinian areas prevents Palestinian women from entering the labour market, noting that only 25 government-supported day care centres operate in Palestinian areas in Israel whereas 16,000 operate in Jewish areas. For example, the organisation points out that in 2015 and 2016 Israel demolished 240 Palestinian houses, tents, animal sheds, stores and poultry farms in the Jordan Valley, displacing 647 Palestinians. These measures, Al-Haq says, resulted in “devastating consequences” for Palestinian women and deprived them of their right to an adequate standard of living. In Gaza, UNESCO reports, food insecurity among women-headed households is 51 percent while in the male-headed households in which most women live, it stands at 58 percent. As the “primary caregivers in Gaza, women are faced with acute challenges in coping with the large number of families with members killed or injured, the long-term impact of damaged infrastructure and reduced services,” UNESCO states. Israel’s oppression of and violence against Palestinian women is pervasive and occurs at every level of their lives. It can only be seen as systematic. Israel’s settler-colonial policies undermine Palestinian women’s abilities to live full, secure lives, and to contribute to building communities capable of flourishing in the present and in future generations. One way to support the global emancipation of women is to support the struggle for Palestinian liberation.